I made this granola the day after I made my first batch of homemade yogurt. It seemed like the perfect pairing. Though I have to say this tahini ginger batch resulted from a pantry error. Originally the plan was to make a gingerbread granola but I was out of molasses. So instead, I went with maple syrup which works nicely to highlight and not cover up the earthy tahini flavour. Adding a double ginger component makes this breakfast sing. Using a good runny tahini is always key. I used to buy organic tahini from my local co-op, but the texture sucked. Once opened, it got hard almost immediately–you could hear me screaming bloody murder just to wrangle the stuff out of the jar. Now I buy plastic jugs of the stuff that are imported from some faraway country. It’s the perfect texture every time. 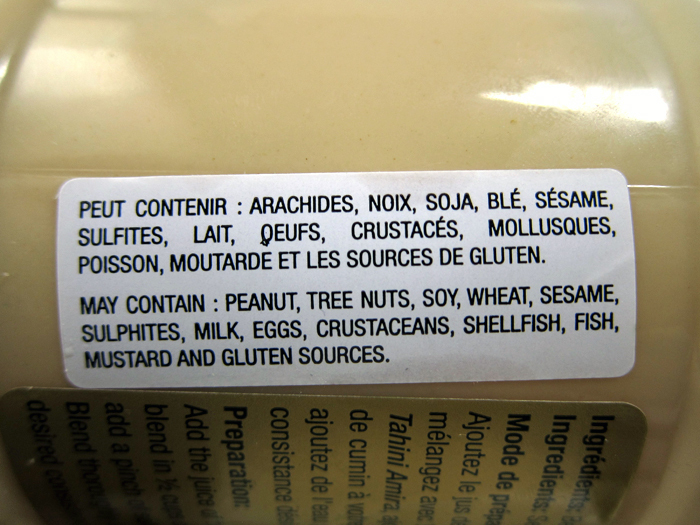 Hmmm….I can only hope my tahini is crustacean-free! The tahini in the recipe not only replaces the oil, but it adds in a bit of protein and a nice mild sesame flavour (which I bumped up with the addition of actual sesame seeds). I’ve got quite a few granola recipes on this site because I like to mix it up in the mornings. This tahini ginger version is a nice change of pace from the usual – especially if you’re looking to expand your tahini usage (it’s for more than just savoury dishes!). Lightly sweetened and the perfect morning companion with your yogurt and strong coffee. Preheat oven to 275F and place the 2 oven racks in the centre of the oven. In a large mixing bowl, combine everything from the rolled oats through to the kosher salt. Use your hands to make sure everything is throughly mixed. In a large mixing cup, combine the tahini, maple syrup and orange juice. If the tahini you’re using isn’t runny, you may need to put some elbow grease into the stirring or add in a bit more orange juice, oil or water to thin it out. 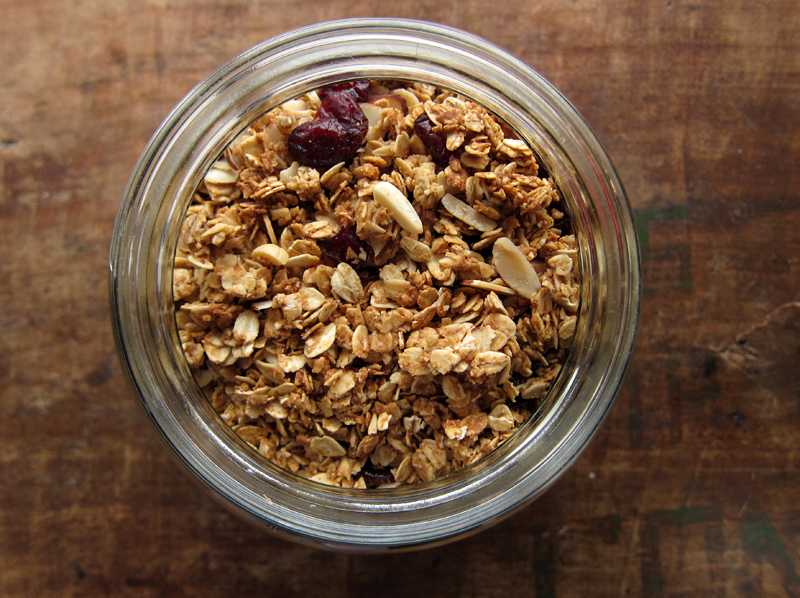 Pour over the granola and mix well with a wooden spoon until everything is good and coated. Divide the mixture between 2 baking sheets covered in parchment paper and distribute the granola evenly. Bake for 20 minutes, stirring the mixture well at the 10 minute mark. Stir in the cranberries or cherries and then bake for another 10 minutes – for 30 minutes total baking time. Remove from oven and allow it to crisp up while it cools. Pack in an airtight jar. I really love tahini and recently bought a jar for falafels (it’s the organic kind – should I be worried? HA). Now I know what I can make with the rest of the jar! And maybe I’ll should give making my own yogurt a try too! That would be impressive. I jumped on the granola making bandwagon about 2 months ago to cut back on grocery costs and I’m always looking for new flavours to try, so I will try this tahini version for sure. As for that contaminants list on the label, that’s insane! Which country is that product from? Oops, I meant to say your tahini-maple syrup combo is similar to the tahini-honey version I’m familiar with….ack, never mind. Never would have thought of this, but I absolutely love the idea of the tahini in granola – can’t wait to try it! Not sure what to say about your strange list of tahini ingredients, although I do live in Thailand and tiny shrimp or shrimp paste sneaks into everything! For the first time ever about 2 months ago, I bought tahini, even though we always thought we could make great hummus without it. Finally, I saw it and got it… wondering, wondering what ELSE to do with it? I am so happy to have something else to do with it. Thank you, I am SO trying it. Foodess, I’ve never heard of it!! Thanks, I’ll check it out. I’m always a bit wary of underground restos because I’m shy, but I really should give them a go. Julie, falafels & tahini sauce go hand in hand – but yes, give this a try. With homemade yogurt too! Bijoux, mmmmm, that sounds so good! Maybe I’ll have to get my inlaws to bring me back some when they head to Greece next (they visit Perros nearly every year). 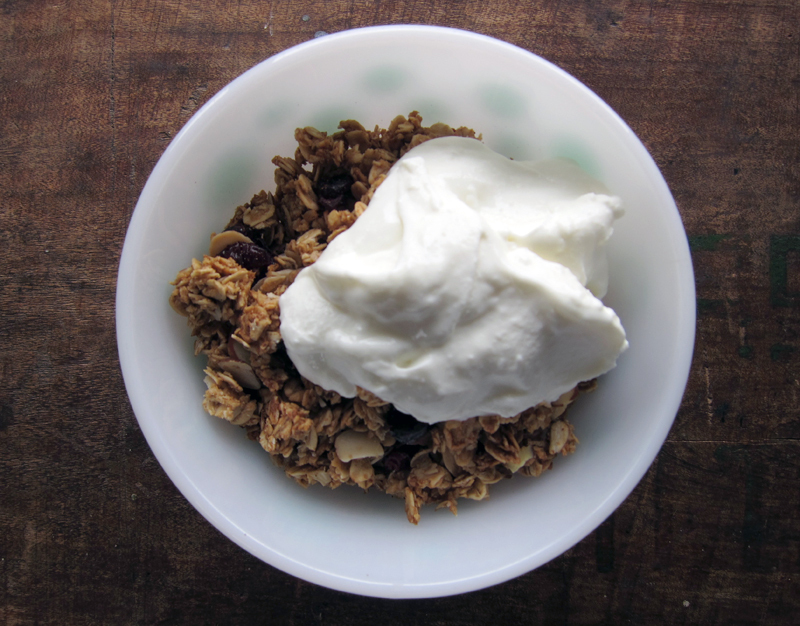 And hooray for making granola – it’s the best. I always try to mix up my recipes so I’m not eating the same one week after week. 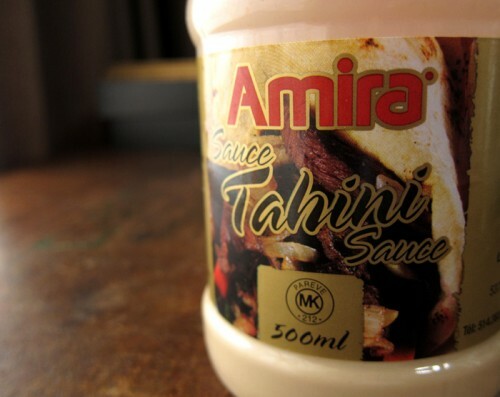 The tahini I think is just trying to cover up their asses to not get sued! This tahini says Montreal but who knows! Jess, the tahini ingredient is sesame butter, but I think they’re trying to make sure they can’t get sued since it’s either packaged or produced in a factory that does other food products. Hilarious though! Ugh I totally know what you mean about the tahini getting too hard! Now I just use a non-organic random brand and it seems to work much better. This granola flavor sounds magical! I love ginger in a serious way, so I know I’d adore this! Oooo…this flavor combination is intriguing! I always seem to have leftover tahini lying around and I like the sound of an extra protein boost. Thanks for sharing! This looks so good! Would you mind if I shared your top picture and link to recipe on my site? I’m a budding blogger sharing healthy recipes! Joanne, it’s a great combo, enjoy! Nicole, definitely makes the granola a bit “heartier” and filling. I love the caps on DOUBLE SESAME EXPLOSION, Eileen!!! Love it. Sally Mae, yes, please go ahead – use the photo and link back to the recipe. thanks for asking! I’ve been visiting your site for about 4 years, and everytime it’s a genuine, earthy experience, that if I as a Capricorn did happy dances…instead I feel like I’m ‘home’…. your site is peaceful, complete. I made this. It wasn’t obvious (to me) if the total cooking time was 20 or 30 minutes, but 30 worked well. You might want to rephrase that bit. Your liquid/solid ratio was dead on. The tahini does impart an unexpected and full mouth feel, but I couldn’t really taste the ginger unless I bit into a crystallized chunk. Anyway, I’ve made around five of your granola recipes and I think this one is my favorite. It has all of the elements I want from granola: a lively taste, nice chunky nuggets, and reasonably healthy ingredients. C’tina, thank you for commenting – you made me do a happy dance of my own! Robert F, yes, 30 minutes total – and I’ve amended the recipe to be more clear (thank you!). I just bought some powdered ginger so when I used it, I noticed how fresh & zingy it was – so maybe that’s why I only used 1 teaspoon. You could bump it up a bit more next time. Glad you enjoyed it! Oh my GOSH, I know I’m a bit late, but I made this last night and IT IS FANTASTIC. I’m going to be making this over and over! (I added 1/4 cup of unsweetened coconut instead of the wheat germ, and it turned out great). I love the idea of using tahini instead of oil too, a great way to add protein, and it adds a great flavour. Thanks! Tara, so glad you enjoyed this! Love tahini and love the idea of adding tahini to classic granola. Will definitely give this a try, sounds absolutely delicious!